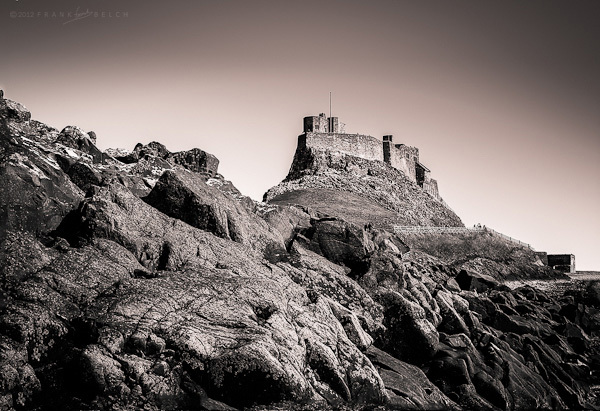 I was just reading a post by Andy Beel (a must see blog), and looking at his image I was reminded of a picture I shot on a visit to Holy Island in April 2011. Andy asks – “Why are the vast majority of pictures taken from 5′ 6″ from the ground?”. A question that made me smile. I remember this was my second visit to Lindisfarne and I wanted to take away a picture that was different from the ones I got on my first visit. This low viewpoint was found after much muttering and cursing after clambering about the rocks and turning my ankles. On the path to the castle were dozens of people taking pictures as they walked, not looking for anything other than the view they got from the path. I suppose a lot of people want a picture that reminds them of the day out and since the beginning of the digital age millions of people are out and about all day every day with a camera in their pocket. They like to just point and shoot, which is great, but they probably would not describe themselves as photographers or have photography in their list of hobbies. Once bitten by the photography bug you don’t look at the world around you in the same way any more. You are always looking for a picture, an angle, an interesting shape, assessing light conditions. That’s what makes us photographers I suppose. Now that you mention it, I am looking at it with your suggestion in mind and it looks to bright in the lower left quarter in particular. I’m off to take another look at it. Lovely shot you have there. One simple question: where is Lindisfarne located exactly? I have re-worked the image and it does work better with the foreground knocked back. Just back from a weekend trip, I may look at it again. Hello Adrian, glad you like this shot. Luckily we have the tools these days to re-think and re-work our images after the event more easily (for me at least) than was the case in the dark room.